Adidas Runbase TRX + Bar Raval-double shot. EXERCISE FOR SOME EXTRA (BRAVAS) FRIES. build your STRENGTH - with an appetite to match - by lifting weights and eating spanish plates. START: Adidas Runbase - Schleusenufer 4, 10997 Berlin. FINISH: Bar Raval, Lübbener Str. 1, 10997 Berlin. U - BAHN: Schlesisches Tor. THE WORKOUT: Thursday night TRX 18pm with Kaya. Invented by the Navy Seal, Randy Hetrick, the TRX is an effective piece of kit for building strength and endurance with just your own body-weight. In her class Kaya combines it with functional conditioning moves and challenging core exercises to work across a variety of angles and plane. 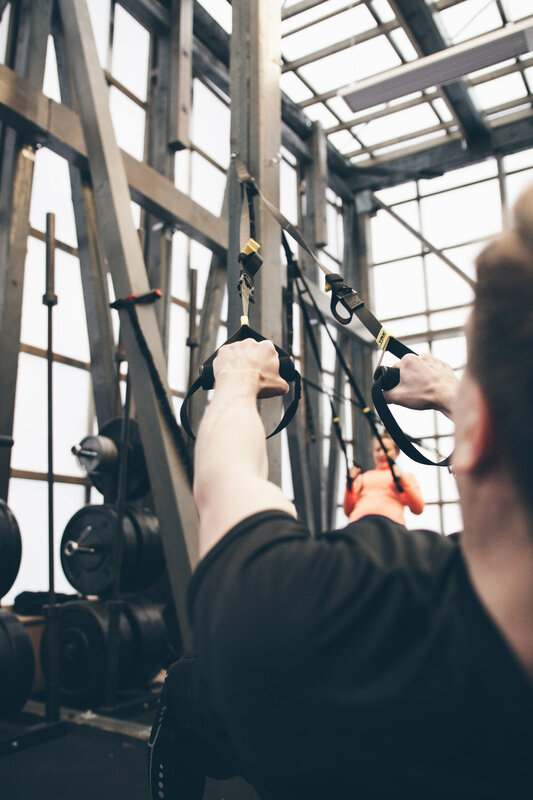 No need for any previous TRX experience - just be prepared to sweat, slip your feet into the straps or grab the handles and wait for Kaya’s instructions. The warm-up consists of various body-weight exercises like jumping jacks, high knees, planks and squats to get the heart-rate up, as well as movements that mobilise your joints to get you ready for the more demanding circuit-based exercises to come. You work in pairs, one on the TRX and the other off, and move through a circuit of two exercises to time - think thirty seconds to a minute on the first exercises, then switch with your partner to perform the other exercise set. Things like pistol squats and weighted kettle-bell goblet squats or squat jumps with squat wall sits (an absolute killer) might be your two exercises. You’ll repeat this three or four times and finally get a recovery break at the end. Then its onto new exercises with the same work pattern. Each set of exercises are chosen to work different muscle groups and ensure the entire body is challenged. No class is the same so your body is always adapting. Kaya’s vibe is always energy-high and super positive, so you remain motivated to the end. The session ends with a quick cool-down stretch to make sure you won’t stiffen up later. You’ll come out of class feeling tightened, toned and over time you’ll see improved muscle tone and overall fitness levels. FYI: When Kaya is away, Dany leads the class with some really killer combo’s and always featuring her signature move ‘the dragon’. THE FOOD: After TRX you’ll be ready to eat and Bar Raval’s rich, hearty flavours hit the spot. The permanent menu features popular Spanish classics like “Patatas Bravas” with spicy tomato sauce and tangy aioli, pan-fried “Pimientos de Padrón”, juicy garlic prawns and tortilla, all perfect dishes to soak up the many glasses of wine you’re likely to drink here. There’s also a changing seasonal menu with recommendations from the chef that are a bit more unusual. Chorizo ragout with chickpeas is a solid winner; spicy, filling with a richness cutting through the sauce. Fried aubergine with honey comes crunchy and hot on the outside and soft and sweet on the inside. Other dishes include braised vegetable, walnut and blue cheese salad, deep fried baby squid with a creamy vegetable sauce and various varieties of gazpacho (watermelon is one of their best-sellers). Complement the food with some fuerte (strong) red Rioja or a smooth Spanish beer. If you can’t get enough of Bar Raval then you should know that on the first Monday of each month they cook a giant paella (anything from typical seafood or meat paella to "black rice" with cuttlefish. TRIPLE SHOT IT: Head over to Watergate - just a ten minute walk away. As one of the city's longest-running electronic music clubs its a firm local favourite, so expect to queue (try and get on a guest list if you can). These guys pioneered the 'Berlin sound' (think minimal techno type stuff) and always have a consistently good DJ selection, mixing big-names like Paul Kalkbrenner playing alongside local talent. Inside the LED-light-filled ceiling, top quality sound system and wooden deck that juts out onto the Spree, set the scene for an epic night. No dress code - but its Berlin so keep it casual (if in doubt wear all-black). THE PRICE: Adidas Runbase charges €10 for a single class or €70 for a monthly membership (its also part of the Urban Sports Club Offer). They charge €1 to borrow a refillable water bottle and another €1 for a shower towel. Bar Raval: Pimientos de Padrón €4.5, Berenjenas Fritas con miel (Aubergine honey) €6, Patatas Bravas €4.7, Fried squid with vegetable sauce €6. Glass of wine €4. BEST FOR: Working up an appetite, before satisfying it whole-heartedly - tapas-style.